In the dozen years that Neptune has been in Aquarius -- a transit that started the same year Bill Clinton was impeached, 1998 -- there's been an absurd increase in secrecy by government agencies. Particularly since the Sept. 11 incident, it seems like everything has become a state secret, held in the interest of national security and fighting terrorism. George Bush even traveled to Europe with a Secret Service portable potty to prevent foreign spies from analyzing his poo. 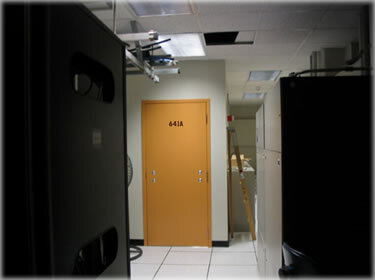 Nondescript-looking Room 641A was referred to in an internal AT&T document as the SG3 Secure Room, located on Folsom St. in San Francisco -- where for years private Internet traffic was intercepted by the government. This was done in the name of "national security" when in fact it was the government who was keeping secrets -- thousands of which have now been revealed. At the same time, despite much lip service paid to privacy, government agencies such as the NSA have taken it upon themselves to collect our email and phone calls in vast databases, and provide themselves with all kinds of power to read our computer disks, enter our homes without leaving a trace and track our location by GPS anytime they want. People who live in cities are photographed walking on the street many times every day. The result is a sickening mix of nearly total lack of transparency by the government and the disappearance of any notion of the privacy of individuals. There's a reason for all the cloak and dagger: presumably, the government has something to hide and is paranoid about it. Secrecy is a form of deception; each would be impossible without the other. And there is a reason for all the prying ears and eyes: the fear that we might be spying on them, or plotting the BlackBerry revolt, or learning too much and putting it up on Blogger. Much of that secret information would presumably involve the ongoing occupations of Afghanistan and Iraq, packaged as the "War on Terror." These are projects on which the American government has invested about $1 trillion (plus interest) of our tax dollars, and those of our children and grandchildren, in just nine years. Along the way our government has killed somewhere around 100,000 civilians in those countries (that is the documented number; it's really much higher, such as by a factor of four). Specific reports of civilian deaths have been especially difficult to track down, while the military reassures us how precise their bombs are, magically only hurting the bad guys -- such as when a whole town is bombed. We know exceedingly little about those wars or even why they're being fought; nearly all of what we get is processed, filtered news from embedded reporters, jingoistic political rhetoric about freedom, and lots and lots of spin. We hear terms like "mission drift," which means a war was started for one purported reason, with one stated goal, and it now has a different rationale and a different objective. We have gradually discovered that the impetus for these wars was based on lies, whether you consider that American forces chose not to capture Osama bin Laden at Tora Bora in late 2001, or that the WMDs that Iraq was going to use to blow up the world didn't exist -- nor did its connection to the Sept. 11 terrorists. Wars, even the ones we think we love, are always based on lies. For example, numerous American companies provided supplies, equipment and technology to the Nazis during World War II, including Standard Oil (Esso, which became Exxon), IBM, ITT and others. Where there is war, there is deception. And every rare now and then, the truth comes out. On Sunday as you've no doubt heard by now, an organization called WikiLeaks released to the Internet a database of 91,000 previously secret government documents collectively being referred to as the Afghan War Diary. The database contains, among other things, the ground-level paperwork for the war between 2004 and 2010, detailing numerous individual operations on a day-by-day basis. It's a collection of original documents, much of it similar to a police blotter. It's highly organized, searchable and impeccably programmed. In a phrase, it's a diary of death. The reports give daily statistics, in chilling, orderly detail, how many people we are killing and under what circumstances, providing a rare glimpse into the actual suffering involved in the occupation of Afghanistan. Because written data allows for comparison, they also shed light on how many civilian deaths are being covered up -- that is, categorized as combat deaths. The categorization reduces the gradual killing of a population down to a bureaucratic function. The database was made public Sunday evening within hours of the Aquarius Full Moon, which is like a natural surge of socially conscious energy. Sunday's lunation made contact with many large or potent planets (Jupiter, Saturn, Uranus, Pluto), as if illuminating a subconscious circuit network and suddenly allowing information to move freely through awareness. And -- incredibly -- the documents were published the day before the fifth and final opposition of Saturn and Uranus, which is taking place precisely on the Aries Point. The first of these oppositions occurred on Nov. 4, 2008, the day Barack Obama was elected president, promising to escalate the war in Afghanistan. For reference, aspects between Saturn and Uranus repeat about every 45 years, in a little cluster that is really one event. The last time we had a series of Saturn-Uranus oppositions was between 1965 and 1967. Here is a list. Because the Earth is orbiting closer to the Sun much faster than those two big boys, the aspect realigns five times over about two years, then the cycle moves on. The first four oppositions occurred in Virgo and Pisces. The fifth occurred after both planets had moved into new signs, Aries and Libra -- precisely aligned with the first degree of the zodiac, called the Aries Point. Initially, the release of the database sent out shockwaves and there was a sense of revelation. The pants of the war had been pulled down. Official spokespeople and retired generals have been all over TV, in the same breath saying that the information is old news and useless, and also calling the release of the data totally irresponsible and potentially harmful. Translation: the data reveals we're lying to you. Then even "liberal" bloggers such as Andrew Sullivan said the data was basically a non-story. Robert Gates, the defense secretary, said this week that information in the database does not reflect official U.S. policy. 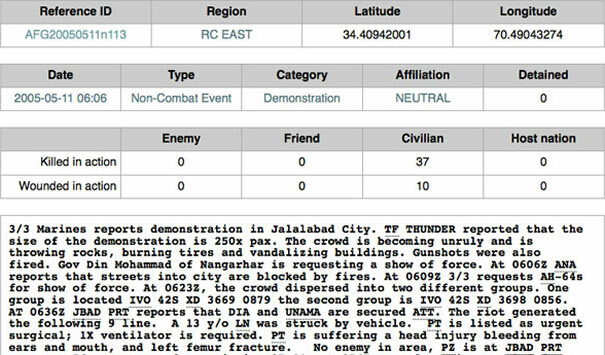 When I entered the document collection randomly for the first time Monday night, I landed on a report of a 2005 incident (categorized as a 'non-combat event') in which U.S. Marines had killed 37 unarmed civilians at a demonstration and injured 10 others. No combatants were killed, injured or captured on either side -- just 47 civilian casualties at a protest. That sounds like a massacre. Now, is this why you work two days a week to pay Uncle Sam? I didn't think so. Page from the Afghan War Diary that reveals a Marines action causing the deaths of 37 civilians and the injuries of 10 others. No actual enemies were killed or captured, and the Marines took no casualties, indicating that this was basically a massacre of civilians. View the full page here. This 2005 report was a rare example where it was clear what happened: the Marines were called in to quell demonstrations, and did so by opening fire on unarmed civilians. This is what we're not supposed to know about; this is what Congress spent another $59 billion on this week before going home without extending unemployment benefits. We're also probably not supposed to know that the military's jargon word for unidentified "person" or "persons" is pax -- the universal Latin word for peace. It is worth meditating on the crude, vicious cynicism of this as a way of glimpsing the military's state of mind. "Here's what I did, for what it's worth: looked at the first and last ten entries in several categories, and noted the following: 1) The absolutely insanely, improbably vast ratio between enemy killed and civilians killed (e.g., repeated air strikes on populated areas resulting in many enemy killed, but zero civilians); 2) Numerous discrepancies between the text reports and the accompanying charts, e.g., text reporting two enemy killed, chart listing zero; text reports eight enemy killed, chart lists 50 enemy killed; text reports 60 civilians killed, chart lists zero. Even to themselves and each other, military reports are unquestionably glossing over or lying about civilian casualties." Carol found this example of an air strike on a populated area where the Army reported 67 killed -- all of them allegedly enemy combatants, but with no combatants wounded, and no civilians killed or injured. "A striking, consistent discrepancy is that the ratios of killed to wounded is preposterous, with frequent reports of many killed and none wounded," she wrote. "Either they're killing everything/everyone in sight, which would have to include civilians, or they're making up numbers like in a Monsanto dioxin study." Here is another example of an air strike on a populated area where 17 "enemy combatants" are killed, none are injured, and no civilians are killed or injured. One potential reason for a "kill everyone and let God sort them out" policy would be to leave no witnesses who could testify to what happened. From doing this preliminary research into the Afghan War Diary, it is clear that WikiLeaks intended to provide the media with a resource to conduct primary source research, rather than the usual policy of reprinting press releases or writing articles based on quotes from Pentagon briefings. Not affiliated with Wikipedia (the term wiki is a Hawaiian word for quick, and in Internet jargon it's an open-source framework for an easy-to-use database), WikiLeaks is basically a clearinghouse for information provided by public-interest whistleblowers. It is the ultimate nightmare for those who prosper and thrive on secrecy. Providing a secure portal for government officials to release secret documents in the public interest makes it more appealing to do so for those who have a conscience. WikiLeaks has designed a system whereby its websites are hosted on hundreds of servers that are mirrored around the world. Though based in Sweden, it has no one location. The site has a secure document submission system so that government or corporate employees can submit documents, taking less of a risk of getting caught. The site is organized to protect the identities of those who provide the material, and indeed under the laws of Sweden, it is legally obliged to do so. WikiLeaks then authenticates the documents before releasing them to the public. The files are scrubbed for hidden code that could reveal their source. While it hasn't been established for sure who leaked the Afghan War Diary documents, last night CNN was reporting that Wired.com had posted a confession back in June. This came from from Pfc. Bradley Manning, who is being held in Kuwait in a separate incident of giving a classified document to WikiLeaks. Edited transcripts of the chat sessions where this information comes out have been republished by Wired.com. WikiLeaks was founded by a man named Julian Assange, an Australian who got his start in computers as a teenager using a Commodore, and became a prodigy hacker. He was recently profiled in an article in The New Yorker. It's a long piece -- it will take about half an hour to read -- though I recommend it because it will tell you something about who he is and why he does this work, and reveal something about how the world works. Here is the link to that article. 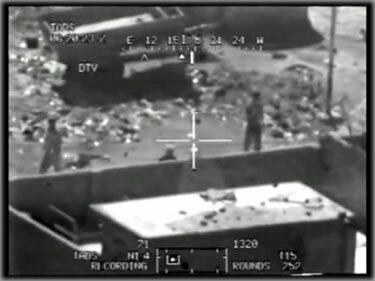 Scene from Collateral Murder showing a massacre of civilians by two American gunships. Many civilians and two reporters were killed. The video was decrypted and released by WikiLeaks in April. One of the most notorious documents ever released by WikiLeaks was a video of a July 12, 2007 helicopter attack conducted by the U.S. Army, which killed Reuters journalist Namir Noor-Eldeen, 22, and his assistant and driver Saeed Chmagh, 40, and an unknown number of civilians, including women and children. The Army refused to release the video. Finally a whistleblower provided a copy to WikiLeaks, which took Assange, who is a cryptologist, three months to decode. It was then published in April under the title Collateral Murder. The video clearly depicts the massacre, including the two Reuters journalists whose cameras were 'mistaken' for weapons. So far 139 journalists have been killed while doing their work in the seven-year Iraq occupation, as compared to 63 during all 20 years of the Vietnam War. Earlier this month, Pvt. Bradley Manning, a 22-year-old intelligence analyst with the United States Army in Baghdad, was charged with disclosing this video (after allegedly speaking to an unfaithful journalist). To cast the natal horoscope for WikiLeaks, I looked up the domain in the Who Is directory, which lists the owners of all websites and the date the domain was registered. In the case of WikiLeaks, the registration also gives the time and the place of the registrant, so we have enough information to cast a chart. Here it is below. Click for a larger image and here is a key to the glyphs. In case you want to look at the minor planets, here is a nice assortment. Chart for the creation of the WikiLeaks domain, according to the WhoIs Directory. The chart's ascendant connects to the Sept. 11, 2001 incident and the Dec. 26, 2004 earthquake in Indonesia. Full size image of chart is here, with a discussion. 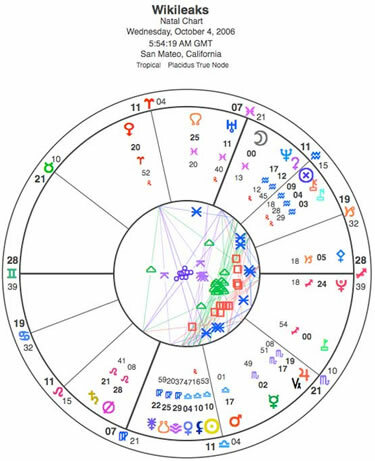 Not shown in the chart is the asteroid Arachne -- which is about conspiracies and interconnections -- right in that late Gemini ascendant. The first thing I noticed is that the website was registered on St. Francis Day. That is a great patron saint to have. 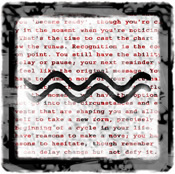 In this section, I'll point out just a few easy-to-spot chart features that give this horoscope its particular mark of distinction. This is one of the most astonishing custom-fit charts that I have ever seen. For one thing, Uranus, the revolutionary, is in the house of government -- the 10th house. Uranus is in Pisces. The WikiLeaks team of hackers, cryptologists, secret donors and its international infrastructure make it impenetrable, in true Pisces style. Going after it is like trying to hit fog with a stick. When I first cast the chart, something jumped out right away: the degree of the Gemini ascendant. That is the bold number 28 located on the left side of the chart, at the end of the horizontal line -- the rising sign or the ascendant (same thing). The ascendant gets a sign and it also gets an exact degree. Sometimes an individual degree of the zodiac takes on historical meaning, and the degree 28+ Gemini showed up prominently in two of the most significant events of the 21st century so far. That is the position of the Moon in both the chart for the first World Trade Center strike on Sept. 11, 2001, and the Moon for the earthquake at Banda Aceh, Indonesia, that caused the Asian tsunami of Dec. 26, 2004. That is correct: the Moon was in the same degree for both of those events; indeed, it was within one-tenth of a degree, a position that it occupies 12 times a year for all of three minutes. I cannot tell you what an earthquake (supposedly a natural event) has in common with a false-flag terrorist attack, except that both events drew mass-scale attention, changed the world and directly affected millions of lives within a very short time. Both events were responsible for hundreds of thousands of deaths. Now this very degree appears as the ascendant of WikiLeaks, an organization seeking vindication and justice for crimes against the people. The ascendant is like the chart's call signal or identifying degree. 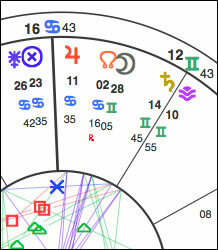 Sample of the Sept. 11, 2001 chart, showing the Moon at 28+ Gemini -- the same degree as the ascendant of WikiLeaks. Full chart shown here. The next feature I noticed is that there is a conjunction of the Sun and the Black Moon Lilith (BML) on the 5th house cusp. First see if you can find it. The Sun is the yellow circle with a dot in the middle, toward the lower right. BML is right next to it -- the dark blue Moon symbol with a cross beneath it. Note that it has the same degree as the Sun -- 10+ Libra. 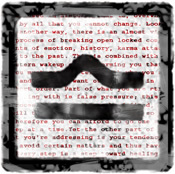 Among other things, BML can represent the dark, manipulative ghost stalking the interior of the mind, or in some way represents the side of life that we refuse to look at. In a phrase, you could call it shadow material. That is a precise conjunction, within the same degree. The 5th is the house of ambassadors and diplomats. The Sun conjunct BML is lighting up all of our darkest national secrets like a Christmas tree. The 5th is also the house of taking chances, and you can be sure that the military informants, diplomats and other officials who submit documents know they are taking a gamble, but they know they must, to clear their conscience. They know they are complicit in murder. Imagine yourself in such a position, well paid, year after year, signing off on the killings of civilians, or witnessing that and not being able to speak up. It's as if the Sun is giving expression to the elusive, dark part of the soul represented by BML. So, too, are the creators of WikiLeaks taking a gamble. They must live on the edge, constantly tailed by intelligence agencies, threatened with prosecution for espionage and on the lookout for radioactive sushi. One last thing. This will require seeing an aspect -- how two parts of a chart talk to one another and combine forces to describe a set of traits. 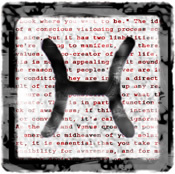 WikiLeaks was founded during the Chiron-Nessus conjunction in Aquarius in the mid-2000s. We wrote a lot about this conjunction, between two of the earliest-known centaur planets, at the time. Here is a short article we reprinted recently. 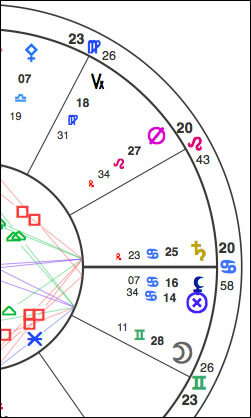 Section of chart for the Banda Aceh earthquake that caused the Asian tsunami, showing the Moon in the same degree as the WikiLeaks ascendant, 28+ Gemini. The full chart is posted here. First, see if you can find that conjunction (in the topmost chart, with the full wheel represented). Look for a blue circle with an X in the middle on the upper right -- that is the Part of Fortune. The conjunction is right below that -- Chiron is the orange key over an ellipse, and Nessus is the light blue N over an ellipse. This is a slow-moving, generational conjunction. Chiron is at 4+ degrees and Nessus is at 3+ degrees. 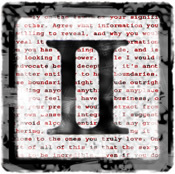 They are in the sign Aquarius, in the 8th house; you can read that as secrets kept from the public; or you can read that as agents of change working for transparency on the public's behalf. 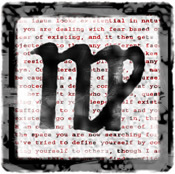 The aspect is coming from Mercury in Scorpio. Mercury is the green guy with horns, on the lower right side of the chart -- very obvious. Take a look. You can tell that Mercury is in aspect to Chiron-Nessus because the numbers are similar -- Mercury is at 2+, Nessus is at 3+ and Chiron is at 4+. The way you say that is, "Mercury square Chiron and Nessus." 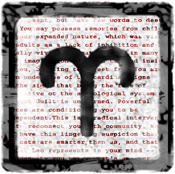 Or, "Mercury in Scorpio square Chiron and Nessus in Aquarius." And what does that mean? Well, remember that Mercury rules the Gemini ascendant -- this slippery, clever, technology-oriented planet is the identity of WikiLeaks. It would be their patron saint, except that St. Francis has that job. In Scorpio, Mercury can handle the deep, dark stuff and that is precisely what WikiLeaks does: its most significant reports have involved revealing civilian casualties, indeed, things that should be investigated as war crimes. Mercury seems to stand out in that house, and is also in a close trine to the Moon in Pisces; this suggests that fact-finding and intuition are both key tools that WikiLeaks uses to do its work. Mercury is square the two centaurs; it meets them at a close 90-degree angle. Centaurs represent both healing process and something that is calling for attention. That something is a blight on the public trust that has been perpetuated by secrecy and deception. 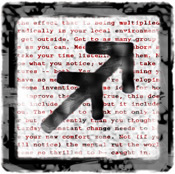 Notice that it's near the 9th, an international house, and in Aquarius, representing electronic communication media. Mercury square these powerful planets will be satisfied with nothing less than total transparency. In Scorpio many of those secrets will involve death, as we have seen. 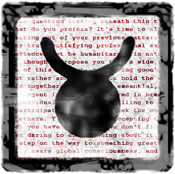 Despite its own reputation for transparency, WikiLeaks knows a lot more than it talks about openly. WikiLeaks is willing to take action -- signified by the square -- to reveal information that will actually make a difference. These people believe in the truth. They know it exists. They know that secrecy is a sickness and that lying destroys relationships. This week, in response to the revelation of the tragic facts of the Afghanistan war, people in positions of power told us over and over again that the truth does not matter. But I would ask you: if the truth does not matter, then what does? Judith Gayle is taking a break this week. Today The New York Times reported in its editions that the Gulf of Mexico has long been a dumpsite for mines, bombs and surplus ammunition -- a story that Planet Waves reported in May. You need to handle a relationship situation carefully, which means gently and consciously. Current cosmic energy patterns suggest that you might be inclined to push or struggle toward a potential future breakthrough, or go to great lengths to get your point across to someone. Be aware that the whole situation could easily blow itself out of proportion with you as the main energy source, and you would do well to set the thing aside for several days and pick up the conversation Monday or Tuesday. Yet you may be feeling obsessed or driven to press on with an issue or a blockage in communication. If you do, I suggest you be willing to let go of the relationship itself -- you just may take things past the point where trust can be repaired. Therefore, if you value the relationship, take a vacation from it. If you're ready to go to the mats, then soldier on. Be careful not to let your frustrations with your work situation run out of control. You are in new territory now, where it's incumbent upon you to develop new methods of organizing your work and, in particular, making decisions. There are times when it's helpful to make choices from a state of frustration and there are times when it's not. Right now, if you act impetuously, or identify too closely with what is not working, you run the risk of burning out or burning a bridge. I suggest you look at what is working, and set an agenda for yourself that is based upon the evolution of your maturity, talent and stamina. If you don't feel like you're doing anything right, that's the place to pause and consider a more realistic, balanced viewpoint. And if you notice that your frustration is the result of conflicting desires, that means you need to set realistic priorities that take into account what you truly want rather than what you think you're supposed to want. How can we explore new sexual territory in a society that all but bans the discussion, propagates ignorance and where nearly everyone suffers from some form of shame and injury? The way would be to open up the conversation, cultivate knowledge and awareness, and focus on healing. Many people have asked me, 'What exactly is sexual healing?' and 'Where would I get such a thing?' Well, one could write an encyclopedia about these topics, or travel the world in search of answers, and in the end it would come down to self-acceptance. Or you could say that it simmers down to an authentic state of wellbeing, which implies shedding judgment and allowing for the natural movement of feelings and ideas. Or, you could say that what we need most is to express our curiosity. You're invited to explore whichever of these feels the best for you, remembering that they all exist outside the bounds of traditional relationship rules. Have you ever written or drawn something that gave you the distinct sense that you were going to get raided by the cops, sent to a psych ward or be cast off from society? In my theory of art, that's your clue that you know you're doing the real thing. Guilt is a sign that you're doing something right -- not, as popularly held, something wrong. The reason I say this is because any authentic form of creativity or for that matter sexual expression is going to push boundaries, and the feeling of guilt is evidence that we are doing precisely that. Along these lines, any seeming threat to your security is evidence that you are successfully reaching for higher achievements. You are moving energy right now, and you're about to move a lot more. Prepare for the internal experience of conflict, chaos, shifting foundations and actual tremors. Thus, explore your deepest pleasures, your daring ideas, your burning desires. The Cancer Audio Birthday Report is now ready. This is more than an hour of astrology for Cancer and Cancer rising, covering the cardinal T-square from a personal perspective. I’ve also included a 20-minute tarot reading using the Voyager Deck by James Wanless. For instant access, order here for Cancer and Cancer Rising. Only $14.95, this also makes a meaningful and economical birthday gift. Something has shifted in your mental environment, and as a result, your perception of relationships. You may be under more stress about this than you've been aware of, then it surfaces, and then it fades into the background again. The current pressure seems like the urgent need to make a decision. It's like you're living in a holoworld where you have to re-think and re-decide every decision you've ever made, and yet at the same time you may have many insecurities about doing just that. This state of being is here to teach you something, but it's not literally true. It would be more accurate to call the whole effect an illusion, which you will be able to see more clearly once the feeling has passed. Then you will be either left wondering what all the fuss was about, or having the whole experience fade like a dream. Yet the symbols in the dream matter, and they will tell you a lot about yourself. Leo birthday report coming soon. You seem to have money on your mind. Either you've reached a state of overt conflict about your finances, or you've arrived at the point where you know you must proceed with focus and determination. In either case, you're likely to come up against the idea that money is a bad thing. I'm not saying you really believe this; I'm definitely not saying you don't believe this. 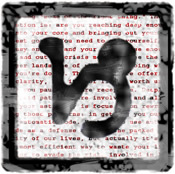 I am, though, suggesting that you observe the thoughts and ideas that run through your mind as you work out what appears to be an extremely complex negotiation process with yourself. That would go a lot easier, were you not trying to drive such a hard bargain. The solution here is to be more generous with yourself, including generous with praise and with recognizing your achievements and value. When you detract from yourself, you detract from everyone else. When you give to yourself, you benefit, and you also ease the minds of the people around you. You have reached a breakthrough point in your self-confidence. It's about time -- for how long have you gone through the gyrations of mental obsession or subtle, gnawing anxiety? Or fear that you're not good enough or talented enough? The human mind is like a pipe bomb. Its power is not created merely by the heat and pressure of the explosive but rather by the containment that surrounds it. 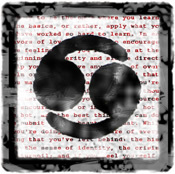 Breaking free of this containment releases your energy and provides you with a sense of both identity and of mission. But you don't need to do this with explosive force, though even a little expression of focused power will reveal just how much authority you have in your life. I will say this: the astrology of the next few days suggests that you be gentle with the people around you. Your words and even your emotions have an influence that you may not recognize and won't be able to feel immediately. When in doubt, understate your case. Express desires rather than demands. Easy does it. You seem to be dealing with some inner authority that has taken over your life, and you're ready to challenge that shadowy force. Doing this may take you places you could write off as negative or unappealing; with astrology like you're having it is easy to take refuge in social situations or busy work. If you are going to do any kind of work, I suggest that it be inner journeying, and that can have a potent creative element to it. Yet whatever you're doing, interior is the direction: that sole/soul space where you can move through the boundary that blocks you from your awareness of what you carry inside, your deepest fears, your most poignant desires. When you get to that space of the unspeakable, you will know you're in the right neighborhood, though it seems essential that you find words or at least images to express your journey. Try to avoid it as you may, you might find yourself in the midst of a controversy of some kind. Remember that controversy is a game, and it has little in common with what it is supposedly about. What you may be seeing is a dramatization of what happens when you dare to stretch out of your prescribed confinement. Prescribed by whom? Well, we could start with all those absurd social rules that we're supposed to follow, and which most people follow knowing how silly they are. What we understand less is what this game takes away from us. I would propose that any controversy you may encounter is a distraction from your creative process that is so rich and promising right now, or that certainly can be if you tune into your core fire. There, I would propose, is the place to focus your love, your energy, your heart, your soul. Leadership has drawbacks; it has challenges; it involves risks. For you right now, leadership is basic to your reality and your integrity, and moreover, deeply influential to who you are becoming. Nobody would accuse Capricorn of being irresponsible, but there are greater or lesser degrees to which you can reach from your deepest calling and sense of identity. It is possible to both avoid and engage your purpose. Pluto in your sign is providing you with a compelling evolutionary need to do exactly what is right for you. 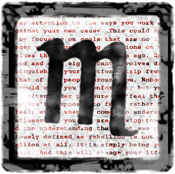 Mars and Saturn crossing your 10th house cusp -- the house of your mission, your reputation and your means of expression in the world. This may have you feeling extremely ambitious, or like you really, really need to be cut a break. I suggest you keep your focus on your mission. Stay aware of the biggest possible picture. Stand out of the way and let somebody else tilt with windmills, while you do what you came here to do. You can safely assume that all conflict you experience is a dramatization of your inner life. The two planets that rule your sign, Saturn and Uranus, are facing off, which to some will feel like a battle and to others like an opportunity to integrate the two dominant parts of your psyche. One of the things that makes Aquarius so interesting is the unique blend of tyrannical and liberationist; of open-minded and lock-step thinking; and the sense of being free and the deep questioning of whether there is any such thing as freedom. 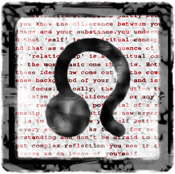 What the planets are illustrating is the idea that freedom comes from working out the seeming polarities not by meeting in the middle, but rather by experiencing both as an expression of something deeper. With Mars coming through the mix this weekend, I suggest strongly that you stay in touch with that something. You are seeing how challenging it is to be involved in committed situations; you are figuring out how much care and caution is involved, and the extent to which you must maintain balance as a way of staying in touch with both sanity and pleasure. And then there are those days you want to smash the windows and the doors and the barricades and burn your diaries and your marriage license and smash your obligations into bits and, well, this weekend's chart looks and feels like such a moment. I suggest you have a commitment-bashing ceremony this weekend. Give yourself a free space. Make sure you don't make the mistake of arguing or fighting -- merely take what is yours, namely, your existence. You are cordially invited to find something breakable and hopefully not too useful and smash it with a bat and scream and yell and have a lot of fun doing it. If you've ever considered bd/sm, go for it, or if are so inclined, express your passion all the way.